Now that Super Tuesday is over, it looks like Donald Trump is the likely Republican presidential nominee. Not only is this bad news to women and the majority of the earth’s population against whom Trump’s sexist and racist politics would harm should be be president, but the earth might be Trump’s biggest casualty. ThinkProgress created a climate and energy candidate chart and Trump’s politics regarding climate issues are Onionesque as Trump has repeatedly gone against scientific consensus mocking the notion of climate change while demonstrating that he understands very little about this subject. Just two weeks ago the Potsdam Institute for Climate Impact Research disseminated results for a recent study they conducted which demonstrates that sea levels will likely rise by 50 to 130 centimeters by 2100 unless greenhouse gas emission are quickly reduced. A second study “confirms that during the past millennia sea-level has never risen nearly as fast as during the last century.” These scientists also agree that even if the 2015 Paris Agreement is followed, sea levels will still rise by 20 to 100 centimeters by the end of the twenty-first century. In order to study the rise of sea levels scientists use two lines of inquiry. First there is the process-based computer simulations which calculate how melting glaciers, ice sheet mass loss, and thermal expansion of seawater (ie. warmer water occupies more volume) contribute to this rise. Then there is a less costly approach which is statistical analysis. This is why there is a range of how far the sea levels can rise in response to risk-assessment. Hence statistics tend to give the worse and best case scenarios. Ben Marzeion from the University of Bremen, Germany states that “Curbing greenhouse gas emissions now gives us the chance to prevent sea level rise to accelerate further.” But were one to consult a possible future President Trump on this matter, science is simply a hoax since it gets cold in Los Angeles. In the scientific field of climate studies – which is informed by many different disciplines – the consensus is demonstrated by the number of scientists who have stopped arguing about what is causing climate change – and that’s nearly all of them. A survey of 928 peer-reviewed abstracts on the subject ‘global climate change’ published between 1993 and 2003 shows that not a single paper rejected the consensus position that global warming is man caused (Oreskes 2004). In short, Oreskes confirms a scientific consensus on climate change demonstrating that glaciers melting from Argentina to Tanzania to the Antarctic all have an impact on the earth’s climate change. For instance, Iceland’s Vatnajökull glacier is melting at the rate of 1 metre per year such that the Icelandic government’s Committee on Climate Change has warned that by the next century, Iceland’s glaciers will no longer exist. Ice which has taken centuries to form is now vanishing in just a few years. Yet glaciers do not melt like ice cubes because there is a combination of how meltwater and seawater cause the glacier structure to disintegrate more quickly. While sea levels are estimated to go up in places like India, China, and Bangladesh, areas such as Greenland will likely experience what is called “post-glacial rebound” or “isostatic rebound” whereby the alleviation of weight on the land mass will cause the land mass to rise. 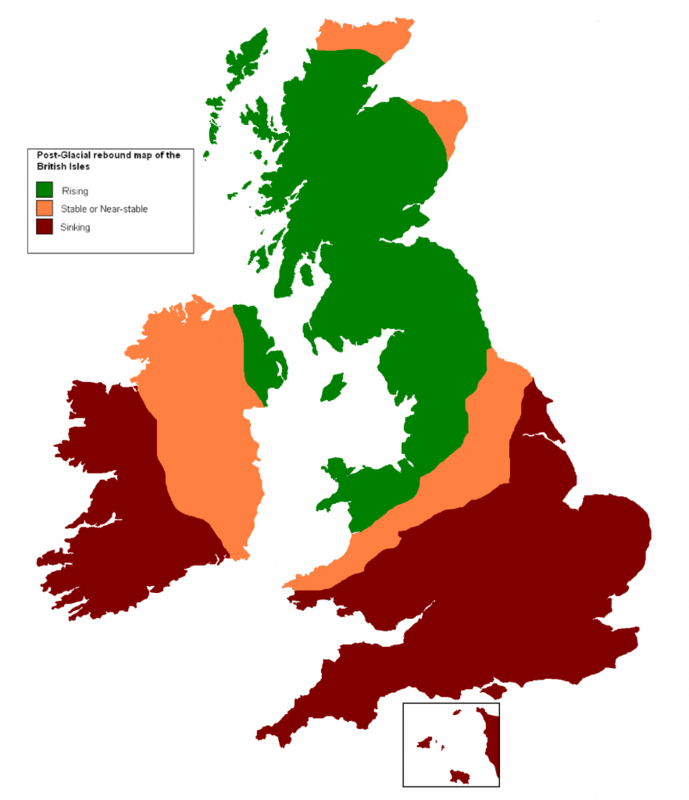 And the United Kingdom is no exception to the phenomena of rising sea levels (the majority of England and roughly half of Wales) and post-glacial rebound (most of Scotland). Source: K. Tynet, Licensed under the Creative Commons Attribution-ShareAlike 3.0 Licence. 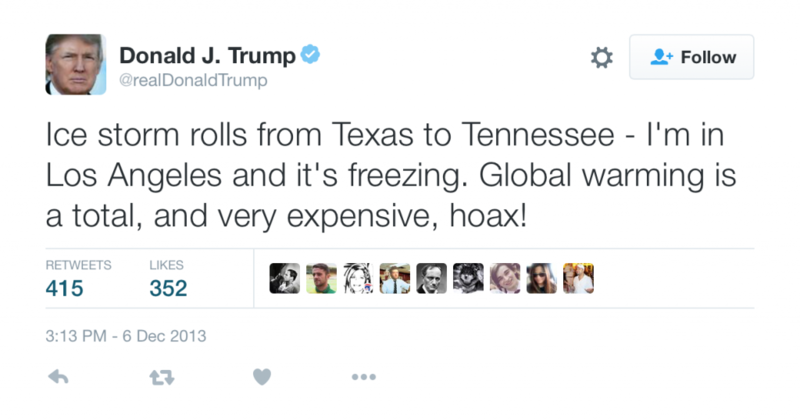 While Donald Trump might argue that cold weather in Los Angeles defies the logic of global warming, science and reality disagree. Hence the terms “global warming” and “anthropogenic global warming” are often replaced with “climate change” today to avoid the literal interpretation that this term connotes (ie. that warming must somehow mean an omnipresent and pervasive warming of the earth). As polar ice caps directly impact weather and climate changes such as the jet stream and the El Niño Southern Oscillation (ENSO) give rise to El Niño (the warm phase of ENSO) and La Niña (the cold phase of ENSO), we know with certainty there is a direct link between tropospheric temperatures and glacial melt. It is not that Los Angeles gets cold which defies the existence of climate change, but it is the oscillation of these temperatures and other weather patterns which precisely defines and gives evidence to global climate change. The larger political answers to climate change will come into play if Trump actually becomes the next US president since he made it quite clear during the 25 February Republican debate that he would dismantle the EPA (Environmental Protection Agency). This article was posted on Thursday, April 14th, 2016 at 8:59am and is filed under Climate Change, Environment, Iceland, Science/Technology.